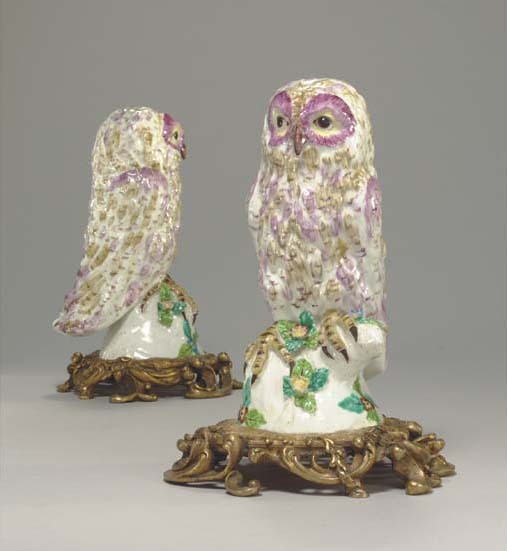 Almost certainly the pair (unmounted) sold Sotheby's & Co., London, 28 October 1952, lot 120. See Frank Stoner, Chelsea, Bow and Derby Porcelain Figures, pl. 105 and Yvonne Hackenbroch, The Irwin Untermyer Collection, London 1956, pl. 78, fig. 259, formerly in the Francis L. Dixon Collection, England, for other examples. For a very similar single model with brown and yellow plumage colouring from the The Harewood Charitable Trust see Christie's London, 2 June 1986, lot 314. For a very similar single model with brown and yellow plumage colouring from the The Harewood Charitable Trust, see Christie's London, 2 June 1986, lot 314.